Okay, so how exactly would Sailor Mercury match up to Sailor Uranus? Well, we put both Sailor Senshi in a high-tech space age computers, and we took the information supplied by us and a special team of animators to come up with the ultimate match up! Unfortunately, the animation would take just way too much disk space, so we have our commentators do it for us. Straight from the Death Buster Headquarters we have Mimete & Eudial! Mimete: Hi, minna-san! Welcome to another exciting round of Senshi Vs. Senshi!! 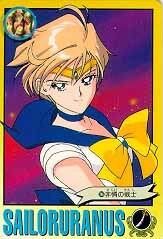 Eudial: Tonight's competition is between the all powerful leader of the Outer Senshi, Sailor Uranus, against the brainiac of the Inner Senshi, Sailor Mercury! Mimete: And, as a special treat, we're being visited by our, um, friend, Viluy-san! Mimete:: Viluy-san, didn't you kill yourself though? Eudial: It begins! Uranus starts off with physical contact! She leaps over the surprised Mercury, then proceeds to beat the crap out of her, kicking and punching her with a series of powerful blows! Mimete: Ouch, that *has* to hurt! Viluy: Yes, Uranus! Go, baby, go! Eudial: Mercury uses her Shabon Spray to cover the area with a blue mist... That will hold off Uranus for a while, won't it? Viluy: Uranus gets tired of waiting for Mercury to find her... [Geez, I want her minicomputer!] She uses her World Shaking to dispell the mist around her! Eudial: Mercury takes out her Mercury Harp and says, " Mercury Aqua-"
Viluy: Mercury, in a feeble attempt to make herself look decent, throws her harp at Uranus! Eudial: That was pretty pathetic... Uranus just kicks it away... It didn't even *hit* her! Now Mercury looks freaked and starts to charge Uranus! Viluy: GO, URANUS! KILL, KILL! DEATH, DEATH! Mimete: Oookaay, Viluy-san... Uranus looks contempuously as she moves out of Mercury's path! The blue haired girl falls flat on her face! Mimete: Uranus takes out her Space Sword again! As Mercury starts to get up, Uranus makes one clean swipe with her sword... EWWWW!!!!! Viluy: YAY! Heads rolling! Mercury has been DEFEATED! Long live Sailor Uranus! Mimete: Thanks to Viluy-san for being our special guest! Ja ne, minna! See you next time!